Movieola: Free Movie Night In Orlando! Lake Eola’s free outdoor movie series is back for 2015 and better than ever! It’s Movieola! 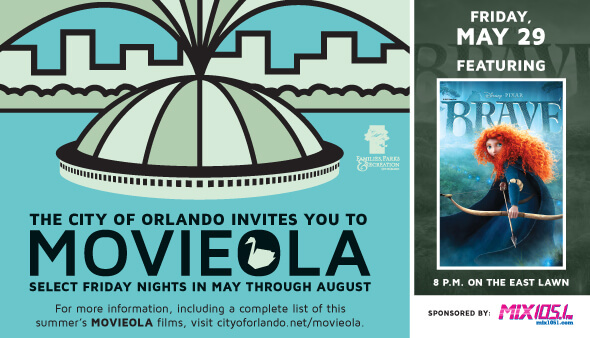 If you’re looking for something laid back to do with the family during your visit to Orlando, look no further than Lake Eola’s free outdoor movie series, Movieola! You can bring blankets, chairs, snacks and the whole family to catch a wide variety of kid-friendly movies. Food is available for purchase as well, leashed pets are welcome, and you can show up early to secure a great spot and enjoy pre-movie activities including croquet, corn hole, washers, music and more. Movieola kicks off at 6 p.m. on select Friday nights from May through August, and you can enjoy the weather and free things to do until the sun sets and the movie starts at 8 p.m.
Croquet, corn hole, washers, music and activities set up by Mix 105.1. Pizza, hot dogs and Kona ice cream (food selection subject to change). The East Lawn is located on Eola Drive between Washington Street and Central Blvd., right next to the playground! Street parking is available, as is the Thornton Park Garage Directly across from the park on Eola Drive. Florida weather is unpredictable, but unless it’s raining cats and dogs, the show will go on!